Mary Frances Wimmers Tumbush, who went by Frances her entire life, was my husband's great-grandmother through his maternal line. She was born 9 Mar 1872 in Granville Township, Mercer County, Ohio, the only daughter of German Catholic immigrants John Wimmers and Mary A. Hummler. In January 1893*, she married Henry Tumbusch (surname spelling later changed to Tumbush). Between 1895 and 1919, they had eleven children, nine of whom survived into adulthood. Her youngest son, Frank (1914-1997), was my husband's maternal grandfather. She was widowed in 1942. She passed away 14 November 1955 in Rockford, Ohio and is buried 17 November 1955 in St. Henry Cemetery in Mercer County. "Funeral services for Mrs. Frances Tumbush, 83, were held yesterday (Thursday) at St. Henry Catholic Church. Rev. Valentine Fleckenstein officiated and burial followed in the church cemetery. Death occurred Monday at the Colonial Rest Home in Rockford, following an illness of one year. She had been confined to her bed for the last eight weeks. Born in St. Henry March 9, 1872, a daughter of the late Mr. and Mrs. Henry* Wimmers, she was married to Henry Tumbush, who preceded her in death 12 years ago. Two sons are also deceased. She was a member of the St. Henry Catholic Church and the Christian Mothers sodality. Surviving are the following sons and daughters: valentine of Valley City; Edward of St. Marys; Leo of Celina; Albert , Anthony and Frank, all of St. Henry; Julius of Coldwater; Mrs. Isadore Steinke of Montezuma and Sister M. Iedephonse of Dayton. There are also 26 grandchildren and 15 great grandchildren, and a brother, Bernard Wimmers, of St. Henry." I placed an asterisk after her father's first name, because it is incorrect - it should be John. John Wimmers passed away due to an accident in 1882, when Frances was only ten years old, so it is understandable that younger family members who wrote this obituary may not have known his first name. Just this past week, I was able to obtain the Frances's death certificate from the Ohio History Connection (formerly the Ohio Historical Society). They recently acquired 1954-1963 death certificates from the Ohio Department of Health, and charge the public a small fraction of what the Office of Vital Statistics was previously charging for them. Amanuensis Monday is a weekly blogging prompt sponsored by Geneabloggers in which participants transcribe family documents, journals, letters, postcards, etc. Gottfried Wimmers was one of my husband's 3x great-grandfathers on his mom's side of the family. Sworn to and subscribed in open Court this 24" day of January, AD 1883. HH Pulekamp, Prob. Judge. Will. Last Will and Testament of Godfried Wimmers, of Granville Township, Mercer County, Ohio, November, 28" 1882. I Godfried Wimmers do make and publish this my last Will and Testament as follows: I will that after my death all of my property, Real Estate and personal property, shall be and belong to Maria Wimmers, widow of my son John Wimmers, deceased, so long as she may live her natural life; provided: that she pays, or cause to be paid, the following: All of debts; and also to Hubert Wimmers, my son, fifty dollars; and to my daughter Agnes Wimmers, five dollars; and twenty five dollars for Masses for my benefit. I Will that after my death and after the death of Maria Wimmers above mentioned, all of the property then left of my estate, shall be and belong to the children of my son John, deceased in fee simple and forever, provided: that if the amounts above mentioned are not all paid at the death of said Maria Wimmers, that than said children of my son John, deceased, pay or cause to be paid said sums not yet paid. I will that my son Hubert and my daughter Agnes above mentioned, received said said sums above mentioned as their full share of my estate, and shall not be entitled to any further sum or amount out of my estate. I hearby declare that my other children, viz: Jacob _ Joseph _ Lorenz _ and William _ have received of my estate their full share which I ever intended for them; and I hearby Will that they receive no more of my estate. I revoke all former Wills by me made. In witness where of I have (...?) set my hand and scrawl seal, this 28th day of November A.D. 1882. Signed, sealed and acknowledged by said Godfried Wimmers as his last Will and Testament in our presence, and signed by us, at his request and in his presence, and in the presence of each other - Bernard Uhlenhake and John G Beckman. Since at least 1870, potentially several years before then, Gottfried and his wife, Eva, lived with their son John, his wife, and his children on the family farm in Granville Twp, Mercer County, Ohio. On September 15, 1882, John Wimmers, at the age of 45, was killed in some sort of accident (see death record below, at bottom). His wife, Maria (Mary), was left to care for five children aged 15 and younger. Gottfried wrote this final version of his will two months after John's death and less than one month before his own death, which occurred on December 17, 1882. He was 79 years old. He was obviously worried about the fate of his daughter-in-law and grandchildren, and left the majority of his estate to them. John's wife, Mary, managed the farm with the help of her sons Henry, John, and Hubert until at least 1900. She passed away in 1919 in St. Henry, Ohio at the age of 81. 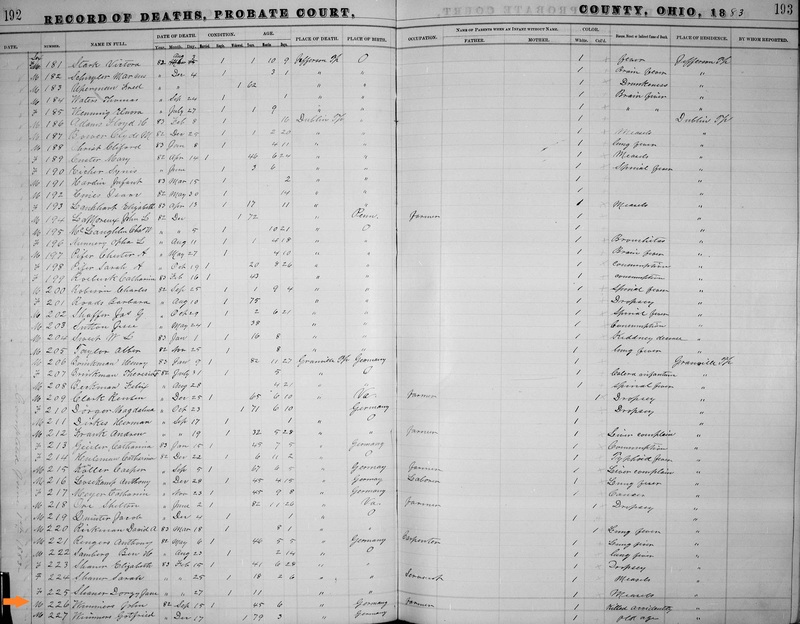 Mercer County, Ohio Probate Death Records for John and Gottfried Wimmers. Yesterday, just after dinner, I received an email from the LDS Family History Library's photoduplication services. On May 29, I sent an email request for an electronic copy of Gottfried Wimmers and Maria Eva Müller's marriage record. (Gottfried and Maria Eva are two of my husband's 3x great-grandparents on his Mom's (Tumbusch) side of the family.) I had found the record in their online index, so I provided them with the film number and reference number. I had heard of other researchers waiting for months for their requests to be fulfilled, so I was surprised to get the record less than a month after I requested it. (I believe most of these requests are handled by volunteers, and the service is provided free-of-charge, so I understand the longer turn around times.) Click on each image to view a larger copy. Of course, like most original genealogical documents, these papers contain MUCH more information than simply what is listed on the searchable index page. The name of the town where the marriage occurred IS listed on the index, but the document itself states more specifically what governmental department the town is located within. So, if the name of the village is common throughout Germany, you are better able to pinpoint exactly where THIS town is located. Also, the spelling of the bride's surname and her hometown on the original is slightly different than the spellings on the index. Her surname is listed as 'Müller' on the original and 'Mueller' on the index, which I understand is a common way to substitute the u with umlaut, but it still could be an important clue when searching for other records. 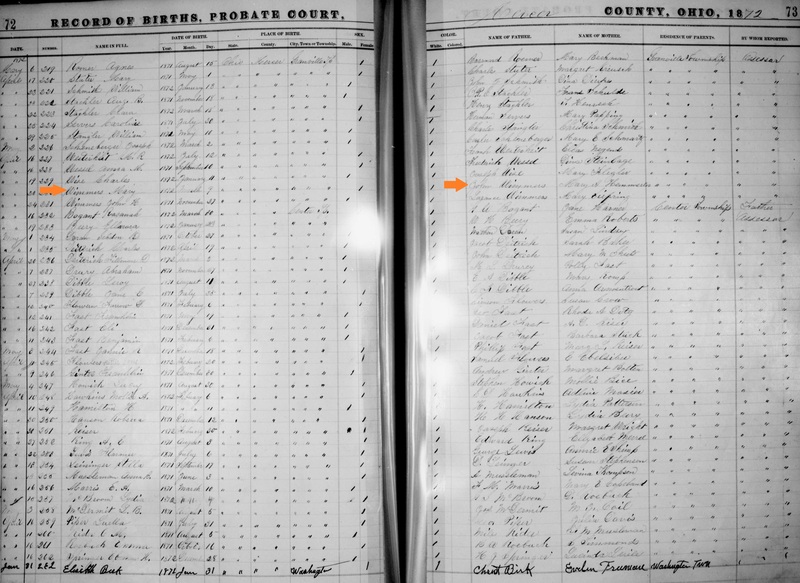 I now also have names, ages, and places of residence of witnesses to the wedding, which can be huge clues to figuring out other family members and close friends. Gottfried and Maria Eva were married on January 31, 1833 in Garzweiler, Germany. The village of Garzweiler no longer exists; instead a huge lignite open-pit surface mine is in the location where the village once stood. The couple immigrated to the U.S. with their children in about 1852 and settled in Mercer County in western Ohio.